[SatNews] SES S.A. (NYSE Euronext Paris and Luxembourg Stock Exchange: SESG) has announced that Arianespace has scheduled the launch of its new satellite, ASTRA 5B, for March 21, 2014. 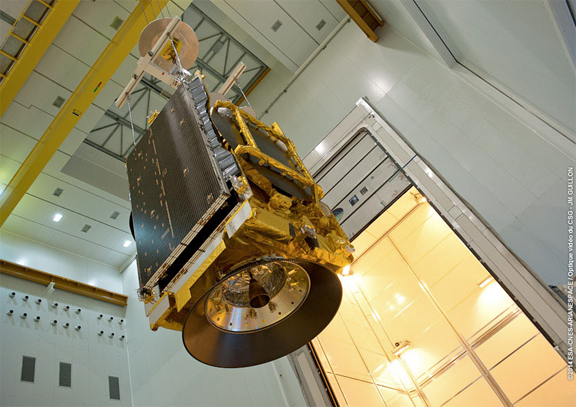 The satellite will be launched into space from the European Space Centre in French Guiana on board an Ariane 5 ECA rocket between 19:05 and 20:02 p.m. local time (23.05 – 00.02 CET; 18.05 – 19.02 EDT). ASTRA 5B was built by Airbus Defence and Space (formerly Astrium) in Toulouse, France, using a Eurostar E3000 platform. The multi-mission satellite will be located at 31.5 degrees East and carry Ku- and Ka-band payloads for the delivery of high-performance Direct-to-Home (DTH) in Eastern Europe and the neighboring markets. States Martin Halliwell, Chief Technology Officer of SES, "The launch of ASTRA 5B will be the 39th launch of an SES satellite on board a European Arianespace launch vehicle. Our long-standing relationship is based on this proven track record and shows the continuous confidence we have in Arianespace and our commitment to Ariane as a launch vehicle. We look forward to a successful mission with this longstanding launch partner."